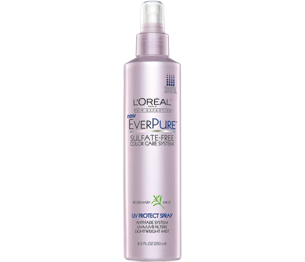 L’Oreal EverPure UV Protect Spray is made exclusively for color treated hair. It protects and conditions for long-lasting color purity. EverPure’s fine mist distributes evenly through hair as its unique UV filters help protect hair and increase resistance to breakage. Hair is left healthy-looking and shiny. It’s 100% vegan–not tested on animals, and contains no animal byproducts. EverPure spray has UVA/UVB filters to protect your tresses from the sun’s harmful rays. 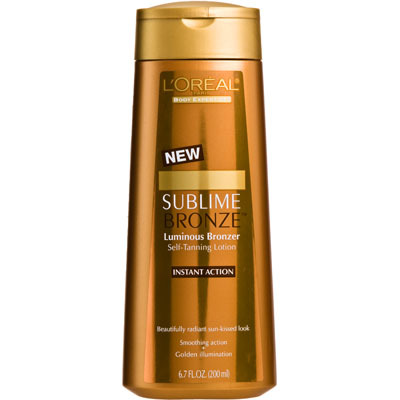 L’Oreal Sublime Bronze Luminous Bronzer Self-Tanning Lotion is a decent self-tanner. You need to make sure you rub it in thoroughly, otherwise it will dry streaky. It leaves a deep tan shade–not too orangey– which is great. But on the downside, it’s full of shimmery sparkles. I kind of felt like a disco ball. Some people might be looking for sparkle, and if so, this is the bronzer for you. If it wasn’t for the disco ball affect, I’d be a big fan of this stuff. It’s a great, basic, drugstore self-tanner. It’s very easy to use and effective.